So you operate a WooCommerce store but are looking to level up your knowledge and skills around exporting your data? Look no further than this post as I run you through what you need to know to become a WooCommerce exporting expert. Fulfilment of orders: As your business continues to grow, you may considering either in-house fulfilment or outsourcing your fulfilment of customer orders. In either case, your order data will need to be exported on a daily basis and used to ensure products are sent to customers as quickly and accurately as possible. Analysis of data: Making sales is only one half of the equation. Exporting your data can allow you to make informed decisions about your products and your customers. Backing up your data: Keeping a backup of all your data is crucial in the case of a system crash. Keeping a daily/monthly export of data can help you avoid a potentially disastrous situation. Orders - eg: exporting daily lists of orders broken down into their current statuses. Customers - eg: exporting a list of customers (and their emails) that have spent at least $1000 to then target them with a special offer. 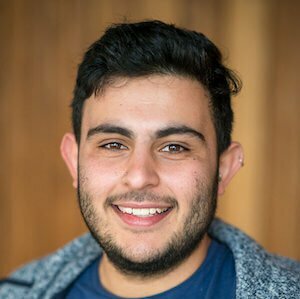 Subscriptions - eg: exporting a list of subscriptions that ended recently, or exporting subscriptions that were cancelled in the past week to try stop those customers cancelling. Products - eg: exporting all products that have low stock levels to then reorder them. Refunds - eg: exporting refunds to look at the products being refunded most frequently or the most common refund reasons. Coupons - eg: exporting coupon codes to see how many sales have been generated using them. Ok Eric, you’ve sold me, exporting data is important! How do I do it? WordPress - Export XML files for products, orders, refunds and coupons with limited information. This is effectively useless though as XML files are difficult to read and comprehend. This tool is built for importing and exporting the data into other platforms that accept XML files rather than being read by humans. SQL - Technically, you can run a SQL query in the database to export data. Here’s an example post on exporting orders using a SQL query. However, you’ll need SQL access on your server (not always available depending on your host) and you need to be cautious as a mistake in your query could result in deleting all of your data instantly. Any built in option suffers from the same flaws, it is either very complicated and requires serious coding knowledge to gain meaningful information, or is very basic and does not provide any meaningful insights, eg: you can only export all data, or one very small specific segment. Both free and paid plugins can be a suitable solution in specific situations. Free plugins generally offer very limited functionally and often require to pay for a pro version with the full feature set. And while they may be a perfectly good solution in the early stages of your WooCommerce store (100 orders per month), when you begin to reach thousands and tens of thousands of orders a month, you may run into significant performance issues that could crash your site. But as you can see, it requires 3 separate plugins, each with their own UI and settings, to be able to export orders, products and customers. Not a very user-friendly experience. Performance issues - This is a simply limitation of how WordPress is built as the plugin is stored on your WordPress server/site. A large data export can be a resource intensive process which could result in your site slowing down or even breaking, therefore impacting your customers’ experiences (and costing you sales). Metorik securely connects to your WooCommerce store and stores all your sites data on a seperate server. What does this mean for you? If you get gutsy one day and export 250,000 orders, there will be no impact on your WooCommerce store and importantly, the potential customers shopping on it while you export. Exporting tens of thousands of orders, customers, products, etc. takes moments rather than hours. You can infinitely segment data before you click export. Remember the example above where we wanted to segment customers by location, total spend, and last ordered over 30 days ago? With Metorik, it’s a piece of cake. Metorik can send a daily list of new orders to be picked and packed to your order fulfilment centre automatically. 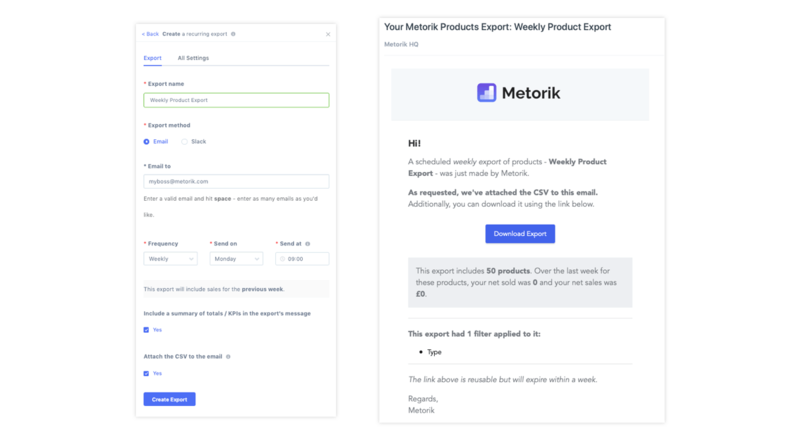 Metorik can send a weekly export by Email or Slack, containing the top performing products of the week to your manager. By default, these automatic exports include a summary in them of the data, as you can see in the screenshot below. Custom columns - include as many or as little columums in the CSV (including custom meta fields for orders, subscriptions, and customers). Want to only include product title, and net sales of that product? No problem! Above we touched on how frustrating it can be exporting WooCommerce data through both the built-in solutions and plugins available. Built-in solutions are often ineffective or require expertise in coding. While a cohesive plugin solution, which is able to export data for orders, customers and products will require at least 3 different plugins. Both will invariably suffer from performance issues as your store continues to grow. Neither of these solutions are elegant or convenient in my experience. To learn more about exporting with Metorik, check out our section on exporting in the Metorik Docs. Zapier, if you aren’t already familiar with it, is a fantastic tool you can use for integrating different apps and automating tasks. For example, every time someone subscribes to your MailChimp mailing list, add them to a separate Google Sheets spreadsheet. Currently, there isn’t a Metorik integration directly with Zapier (although it’s planned! ), but a few creative customers emailed us recently to inform us that Metorik already integrates with Zapier. How? Through automatic exports! So basically, Zapier can automatically read the CSV file sent with an automatic export and do practically anything with that data. For example, it could send the CSV to Google Drive or Dropbox. Or you could automatically build a Facebook Custom Audience through customer exports. To do this, you’ll want to use Zapier’s new email parser tool. We’ll elaborate on how you can combine Metorik and Zapier and do exactly this in a post soon. A single dashboard unifying your store's orders, customers, and products, helping you understand your data and make more informed decisions. Run more than one WooCommerce store? Perhaps they all have different currencies? Metorik's new multistore dashboard is here to make your life 1000x easier. The number of apps Metorik integrates with is continuing to grow! Today we've been added to Shift, making it easy to use Metorik directly as a desktop app.